14th/15th C, Sophora (Huai), Shanxi. Exceptional construction from extinct rare wood, distinguish deep grains, never warps, beautifully styled and carved. 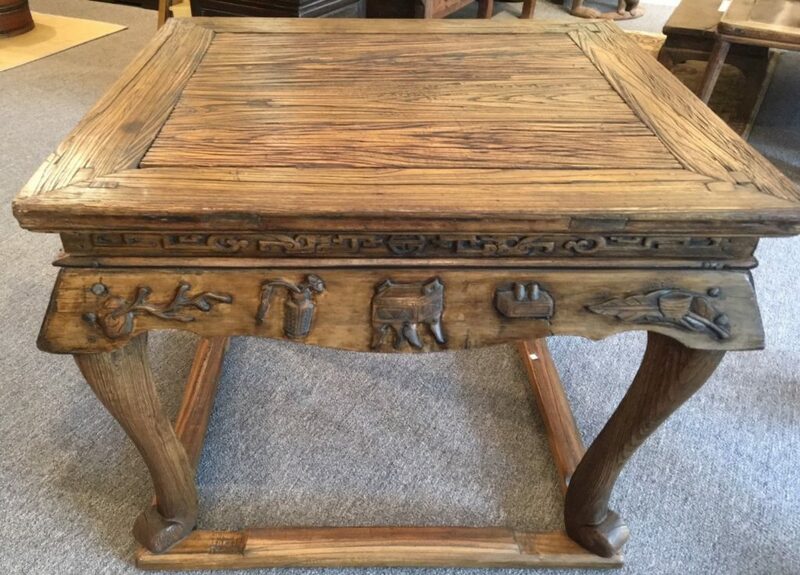 30.5″ x 30.5″ x 30″ h.
This table has a traditional formalized style with archaistic decorations. It is high-waisted and has a wide skirt overhanging four cabriole legs, which terminate on a humpback base stretcher. The top is made of a thick piece of Sophora, a very dense wood which became extinct after the Ming period due to the tree’s extreme slow growth and the wood over-used as building material. (Read more about the wood in the introduction to our gallery’s collection).. This table shows a very early method of construction. The top frame members are joined at the corners with traditional mitered, mortise-and-tenon method of construction. These corner joints are pinned by double lock tenons of the legs penetrating through the top, an early technique prior to the development of more sophisticated joinery. Hand-fashioned nail-heads shown on the recessed waist below indicates the waist was securely joined to the legs by iron pins. Metal was a costly commodity at that early age so the use of it shows this table was such an important piece no expense was spared to have it made. The table top has a floating panel in the middle and “water-stopping ” molded edges. The recessed beaded waist has deep relief carving of stylized dragons with scrolling bodies confronting a “long life” design in the middle. Below the waist is a wide arched skirt with its smooth surface used to display deep relief carvings of the “Eight Treasures” and the “Attributes of the Scholar”, archaistic decorations relating to Confucianism. The cabriole legs are overhung by the skirt at the top part, then gracefully swells out in front but stays flat in the back, tapering down to terminate in claw-like scroll feet attached to humpback base stretchers. This table came out of Shanxi. It survived in excellent condition no doubt due to the integrity with which early construction method was used, and to it being made with a strong indigenous material. The Sophora has such beautiful deep grains that the table needs no painted ornamentation. Its simple grace will add distinction to any décor, traditional or contemporary. The piece never left China until it became part of our collection. With its elegant styling and superb carvings, we consider it one of the most beautiful pieces of Chinese antique furniture we collected.